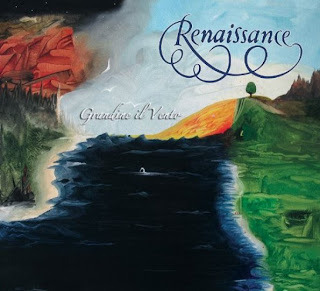 THE CLASSIC ROCK MUSIC REPORTER: “Renaissance: Grandine il Vento” album review: Fantastico! Grandine il Vento the first studio album in thirteen years by progressive rock virtuosos Renaissance was released June 1st worldwide on amazon.com (available in Japan through Marquee Records). 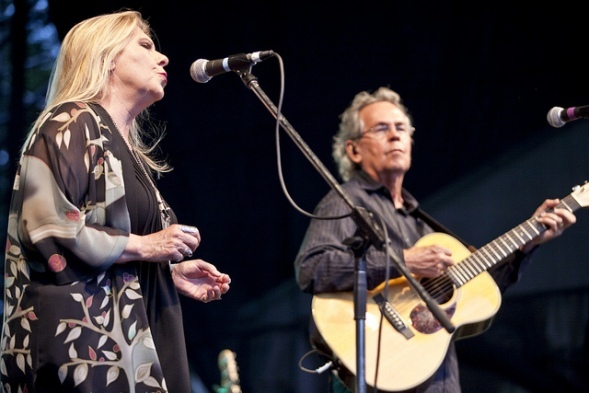 The band recently concluded a tour performing their two-part concert featuring their masterpiece albums Turn of the Cards and Scheherazade and Other Stories. Guitarist Ryche Chlanda was recruited to perpetuate the legacy of Renaissance. At the beginning of the tour, Haslam was diagnosed with a serious vertebral compression fraction (spine injury) and was forced to wear a Jewett Back Brace for several months. Many of the concert dates had to be rescheduled. I had the rare pleasure of chatting with Annie Haslam during the making of Grandine il Vento in the summer of 2012. Annie gave me a sneak preview by singing a few bars of “Symphony of Light” over the telephone. After hearing the piece, I told her I thought the song was powerful, poetic, beautiful, inspiring and almost reduced me to tears. After listening to Grandine il Vento, I thoroughly enjoyed the all-encompassing musical arrangements and was overwhelmed by the commanding classical orchestrations. Haslam’s vocalizations were majestic and the duets were poetic … I gave Grandine il Vento (5) Stars. The breathtaking album cover was painted by Haslam. Annie is an accomplished artist and many of her works can be purchased on her website. The album features guest performances by John Wetton (King Crimson, Uriah Heep, Renaissance) and Ian Anderson (Jethro Tull). Grandine il Vento (Hail the Wind) … Here’s a synopsis of all the tracks on the album. Haslam’s haunting but beautiful interpretation at the introduction and ending of the song spotlights her extraordinary vocal range. The rhythms of the song alone seem to describe its very essence, much like a soundtrack to an epic motion picture. “Waterfall” the second track, is a surreal musical portrayal about the rainforests in Brazil. Haslam has been there many times and says she loved it. “Waterfall” is a winsome and mellow arrangement. “Grandine il Vento” the album’s title track, is described as a love song that transcends life itself. “Porcelain” the album’s fourth track is an engaging anecdote about an African village and the people who live there. “Cry to the World” is definitely one of my favorite tracks … captivating and tenacious! “Air of Drama” the next track, is a love song about two people who come together again later in their lives in Paris, where they had first met. “Blood Silver Like Moonlight” is a duet with John Wetton. The awe-inspiring duet with John Wetton is another favorite track … beautifully done! The Mystic and The Muse” is classic Renaissance. You are now entering … Prog-Heaven! An incredible musical journey infused by intricate mystique. I loved the entire album but this is definitely my favorite track! Renaissance is … Annie Haslam (lead vocals, songwriter and painter), David Keyes (bass guitar & vocals), Rave Tesar (keyboards), Jason Hart (keyboards & vocals), Frank Pagano (drums, percussion & vocals) and Ryche Chlanda (guitars & vocals). Grandine il Vento is dedicated to guitarist and songwriter Michael Dunford.